The Huber lab uses the social amoeba Dictyostelium discoideum as a model system for studying the functions of proteins linked to human disease and the structure and function of the extracellular matrix (ECM). Dictyostelium is a fascinating eukaryotic soil microbe that has long served as a model organism for cell and developmental biology. Inexpensive, easy to culture, and genetically tractable, Dictyostelium undergoes a 24h life cycle comprised of both single-cell and multicellular phases. The life cycle of Dictyostelium. During growth, single cells feed on bacteria. Upon starvation, cells undergo chemotactic aggregation towards cAMP to form a multicellular mound. The mound then forms a finger, which falls on the surface to generate a motile pseudoplasmodium, also known as a slug. During culmination, terminal differentiation of pre-stalk and pre-spore cells forms a fruiting body composed of a mass of viable spores supported atop a slender stalk. When a food source becomes available, the spores germinate allowing the cells to restart the life cycle. Figure on left taken from Huber, 2016. Figure on right Copyright M.J. Grimson & R.L. Blanton, Biological Sciences Electron Microscopy Laboratory, Texas Tech University. The Dictyostelium genome is haploid and encodes many homologs of genes linked to human disease. The genetic tractability of the organism allows researchers to introduce one or multiple gene deletions with relative ease using homologous recombination or CRISPR/Cas9-mediated targeting. Development occurs in a much shorter time frame in Dictyostelium compared to other organisms, which allows researchers to rapidly screen Dictyostelium mutant cell lines for developmental phenotypes. Current research in the Huber lab uses Dictyostelium to (1) reveal the cellular mechanisms underlying neuronal ceroid lipofuscinosis (NCL), also known as Batten disease, and (2) study proteins within the ECM that modulate cell motility and differentiation during Dictyostelium development. Batten disease, also known as neuronal ceroid lipofuscinosis (NCL), is a devastating neurological disorder that affects people of all ages and ethnicities. The disease is linked to over 430 mutations in 13 genetically distinct genes (PPT1/CLN1, TPP1/CLN2, CLN3, DNAJC5/CLN4, CLN5, CLN6, MFSD8/CLN7, CLN8, CTSD/CLN10, PGRN/CLN11, ATP13A2/CLN12, CTSF/CLN13, KCTD7/CLN14). At the cellular level, mutations in these genes cause abnormal lysosomal function which leads to an excessive accumulation of ceroid lipofuscin in neurons, as well as other cell types outside of the central nervous system. The proteins encoded by these genes localize to the endomembrane system, which mediates a number of central processes in eukaryotic cells including, but not limited to, protein trafficking, intracellular digestion, and protein secretion. However the precise functions of NCL proteins in the endomembrane system are poorly understood. Dictyostelium has emerged as an excellent model system for studying the functions of proteins linked to human neurological disorders, including lissencephaly, epilepsy, Alzhemier’s disease, Parkinson’s disease, Huntington’s disease, and prion diseases. 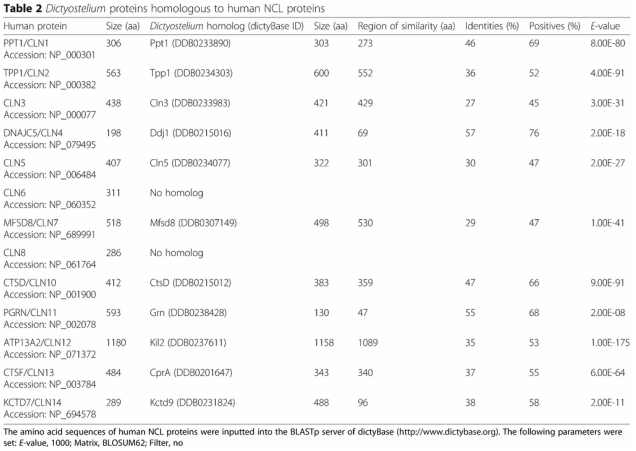 Intriguingly, the Dictyostelium genome encodes homologs of 11 of the 13 known NCL proteins, including homologs that are absent in other model organisms such as yeast, C. elegans, and D. melanogaster (Huber, 2016). Thus, Dictyostelium provides an excellent opportunity to resolve the precise functions of NCL proteins. Our current research uses Dictyostelium to study the function of CLN3 (ceroid lipofuscinosis neuronal 3) and characterize its role in the function of the contractile vacuole (CV) system, which is an important component of the endomembrane system in Dictyostelium. Table taken from Huber, 2016. Our previous work used homologous recombination to knockout the CLN3 homolog in Dictyostelium (gene: cln3, protein: Cln3) (Huber et al., 2014). During the growth phase of the life cycle, cln3-deficiency increases the rate of cell proliferation and impacts osmoregulation (Huber et al., 2014; Mathavarajah et al., 2018). During the early stages of multicellular development, loss of cln3 causes aberrant protein secretion and reduces adhesion (Huber et al., 2014; Huber, 2017; Huber et al., 2017). Finally, cln3-deficiency causes cells to develop precociously (Huber et al., 2014). However, the precise mechanism by which Cln3 affects these processes is not known. Importantly, cln3-deficiency phenotypes can be completely rescued by re-introducing either Dictyostelium Cln3 or human CLN3 into cln3- cells (Huber et al., 2014; Huber et al., 2017). In Dictyostelium, Cln3 localizes primarily to the CV system, and to a lesser extent, compartments of the endocytic pathway and the Golgi complex (Huber et al., 2014; Huber et al., 2017; Huber, 2017). The CV system is a dynamic organelle with established and putative functions such as osmoregulation, ion homeostasis, and vesicular trafficking. Evidence from other organisms supports a function for CLN3 in these processes. We are using this knowledge to fuel research on characterizing the role of Cln3 in CV system function to ultimately determine its molecular function within the cell. We are also engaged in studies that are characterizing the Dictyostelium homologs of CLN5 and MFSD8/CLN7. The long-term goal of our research is to use Dictyostelium to define the functions of all NCL proteins and determine how they contribute to the normal functioning of the endomembrane system in eukaryotic cells. Hopefully the results of this work will provide insight and guide future research into developing therapy options for this devastating and currently untreatable neurological disorder. The extracellular matrix (ECM) is a dynamic complex of glycoproteins, proteoglycans, carbohydrates, and collagen that serves as an interface between mammalian cells and their extracellular environment. Essential for normal cellular homeostasis, physiology, and events that occur during development, it is also a key functionary in a number of human diseases, including cancer and neurodegeneration. Dictyostelium secretes an ECM during development that regulates multicellularity, cell motility, cell differentiation, and morphogenesis, and provides structural support and protective layers to the resulting differentiated cell types. The Dictyostelium ECM shares many of the features of mammalian and plant ECM, and thus presents an excellent system for studying its structure and function. As a genetically tractable model organism, Dictyostelium offers the potential to further elucidate ECM functions and to possibly reveal previously unknown roles for the ECM. Summary of the known components and events mediated by the ECM of Dictyostelium. Like mammals, during multicellular development, Dictyostelium cells release precursor proteins that are proteolytically processed to release bioactive peptides that regulate cell motility and differentiation. Matricellular proteins have been identified that regulate cell motility. Structural and cell adhesion proteins maintain the multicellular status of the aggregate, while the functional roles of the many signalling proteins remain to be analyzed. Based on research in mammals, matricellular proteins could function to mediate these signalling events. Other known roles of mammalian ECM proteins (e.g., morphogenetic functions) have so far not been sufficiently analyzed in Dictyostelium. Figure taken from Huber and O'Day, 2017. As the Dictyostelium slug migrates along the substratum, the ECM is left behind as a collapsed tube, which has facilitated analyses of the specific components that make up the ECM. Our recent work used LC-MS/MS to reveal over 300 proteins in the Dictyostelium ECM (Huber and O'Day, 2015). Proteomic profiling revealed proteins involved in metabolic processes (~50%), transport (~9%), fruiting body development (~7%), biological adhesion (~4%), proteolysis (~3%), and cell motility (~2.5%) (Huber and O’Day, 2015; Huber and O’Day, 2017). In addition, of the over 300 proteins identified, ~48% are involved in some sort of binding, while ~30% are homologous to known enzymes. Together, these findings have provided valuable new insight into the primary functions associated with ECM proteins in Dictyostelium. GO annotation of proteins detected in the sheath ECM of two wild-type strains of Dictyostelium, NC4 and WS380B. Numbers represent the % of the total number of proteins detected. For a complete list of the proteins identified refer to Fig. S2 in Huber and O′Day, 2015. Table taken from Huber and O'Day, 2017. The ECM surrounding the multicellular slug and the cell types contained within. The sheath ECM, which is synthesized from the tip of the multicellular slug, is shed from the back of the slug as it migrates along the substratum. (Top panel) a diversity of processes occur in the ECM during slug migration. Cells secrete EcmA and EcmD which provide structure to the ECM. Secreted proteins such as AcbA and CyrA are processed into bioactive fragments that in turn bind to the cell surface to modulate cellular processes (e.g., spore differentiation and cell motility, respectively). (Bottom panel) different cell types within the slug sort to specific locations. Figure taken from Huber and O'Day, 2017. While the structural components of the mammalian ECM have been well defined, the functions of the non-structural components are still being revealed. Matricellular proteins belong to a family of non-structural ECM proteins that contain binding sites for both the ECM (i.e., matri-) and cell surface proteins (i.e., -cellular). Members of this protein family regulate a diversity of cellular processes and are linked to a number of human diseases, such as cancer and neurodegeneration. Some of the key features of matricellular proteins are that they associate with extracellular proteases and growth factors, are expressed at high levels during development, do not directly contribute directly to the organization or physical properties of extracellular structures, and modulate cellular processes by binding to the cell surface and initiating intracellular signal transduction. In mammals, the most well studied function for these proteins is their ability to modulate cell adhesion and migration through the interaction of their epidermal growth factor (EGF)-like repeats with the cell surface. Our previous work characterized the cysteine-rich, calmodulin (CaM)-binding protein (CaMBP) CyrA as the first matricellular protein to be identified in a eukaryotic microbe (Suarez et al., 2011; Huber et al., 2012; Huber and O’Day, 2012b; O’Day and Huber, 2013). In keeping with its matricellular classification, CyrA contains four tandem C-terminal EGF-like repeats that bind to the cell surface and modulate cell movement during Dictyostelium development (Huber and O’Day, 2009; Huber and O’Day, 2011; Nikolaeva et al., 2012; Huber and O’Day, 2012a; Huber and O’Day, 2012b; O’Day and Huber, 2013). We are currently engaged in studies that are characterizing a cyrA knockout cell line. Our long-term objective is to use Dictyostelium to gain fresh new insight into the structure and function of the mammalian ECM, including revealing new matricellular proteins, proteases that regulate the processing of ECM components, and identifying the functions of the many uncharacterized proteins in the Dictyostelium ECM. Undergraduate and graduate students interested in contributing to this work are encouraged to contact Dr. Huber with a statement of interest, updated CV, and recent unofficial transcript. Full funding may be available for students who qualify.